ODVAS-SERNAGEOMIN reported on 8 June that the Alert Level for Melimoyu was raised to Green Level 2 due to increased seismicity during May, specifically starting with nine long-period earthquakes on 27 May. The next day six long-period earthquakes preceded two separate seismic swarms. The first swarm was located 2-12 km beneath the summit. Earthquakes in the second swarm were located 7-14 km S of the summit at depths no greater than 15 km. All earthquakes were M 2.5 or less. The Global Volcanism Program has no Bulletin Reports available for Melimoyu. 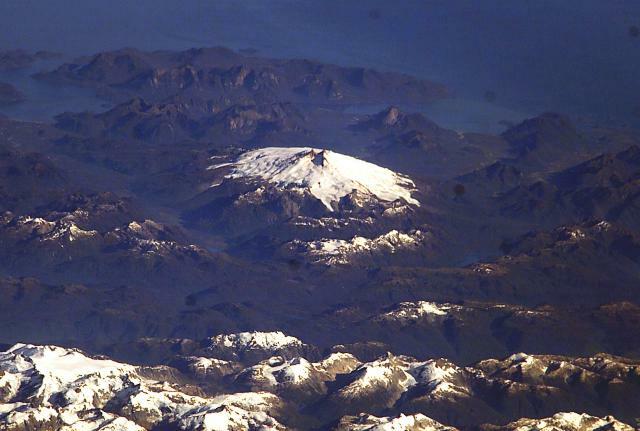 Melimoyu is a stratovolcano with an 8-km-wide, largely buried caldera located ~40 km NW of the town of Puyuhuapi. The ice-filled caldera is drained by a glacier through a notch in the NE caldera rim. The basaltic-andesite volcano is elongated 10 km in an E-W direction and has several cinder cones. A 1-km-wide crater is located at its summit, and two late-Holocene tephra layers have been documented. Fuenzalida R, Etchart H, 1976. Evidencias de migracion volcanica reciente desde la linea de volcanes de la Patagonia Chilena. In: Gonzalez-Ferran O (ed) Proc Symp Andean & Antarctic Volcanology Problems (Santiago, Chile, Sept 1974), Rome: IAVCEI, p 392-397. There is no Deformation History data available for Melimoyu. There is no Emissions History data available for Melimoyu. 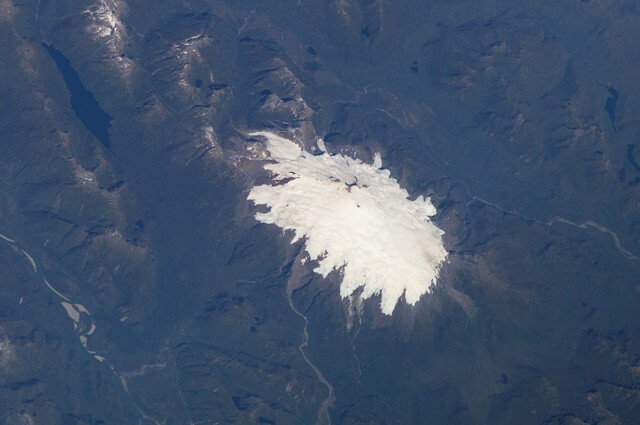 The glacier-clad Melimoyu stratovolcano dominates this NASA International Space Station image (with north to the lower left). The 8-km-wide, largely buried ice-filled caldera is drained by a glacier through a notch in the NE rim. The 2400-m-high basaltic-andesite volcano is of Pleistocene to possible Holocene age and has several cinder cones. NASA Space Station image ISS006-E-42125, 2003 (http://eol.jsc.nasa.gov/). Glacier-clad Melimoyu is the prominent stratovolcano in this oblique NASA International Space Station image looking west toward the Corcovado Gulf. The volcano has an ice-filled 8-km-wide caldera that is drained by a glacier through a notch in the NE rim. The basaltic-andesite volcano is Pleistocene-Holocene in age. NASA Space Station image ISS006-E-42370, 2003 (http://eol.jsc.nasa.gov/). 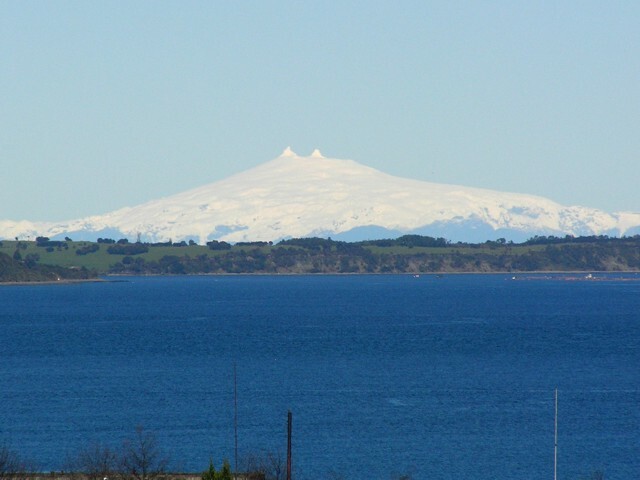 Glacier-clad Melimoyu volcano is seen from the NW from the town of Quellon on the island of Chiloe. The volcano lies across the Gulf of Corcovado beyond the small island cutting across the image in the foreground. Two prominent horns at the summit of the volcano rise above the rim of the summit crater. The large stratovolcano has an 8-km-wide, largely buried ice-filled caldera that is drained by a glacier through a notch in the NE caldera rim. Two late-Holocene tephra layers have been documented from Melimoyu. Photo by Bryan Freeman, 2005. There are no samples for Melimoyu in the Smithsonian's NMNH Department of Mineral Sciences Rock and Ore collection. Large Eruptions of Melimoyu Information about large Quaternary eruptions (VEI >= 4) is cataloged in the Large Magnitude Explosive Volcanic Eruptions (LaMEVE) database of the Volcano Global Risk Identification and Analysis Project (VOGRIPA).